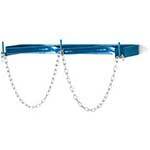 Securely hold three gas cylinder bottles to the wall. 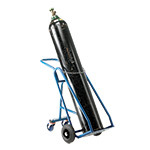 Storage of gas cylinders can be a critical problem in many locations. 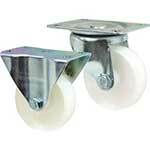 Cylinders that are left on the floor become a tripping hazard and can be damaged by trolleys, handcarts, and the movement of people and goods. The ideal solution is to mount gas cylinders on the wall, where they are readily available for use but are safely stowed out of the direct path of daily work. 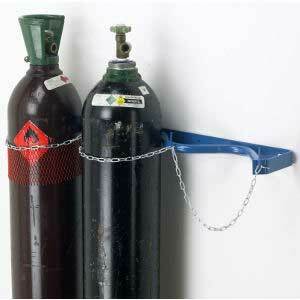 This wall bracket is an economical, sturdy solution for gas cylinder storage. Made in the UK of forged steel, the tubular design will fit most sizes of gas cylinders and can handle tanks of up to 280 mm in diameter. 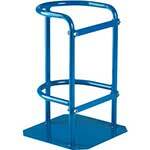 Blue, epoxy-coated paint will withstand many years of use and still look good. The entire length of the unit is 965 mm. Should this not fit into the space required, a smaller, two cylinder wall bracket of identical design is also available. The three niches for the cylinders are wrapped by a bright zinc-plated chain that can be adjusted depending on the circumference of the cylinders. 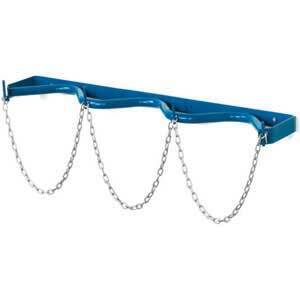 Pegs formed into the wall brackets hold the chain, which can be secured at any length just by choosing the link to loop onto the peg. This simple design saves time and encourages the proper storage of gas cylinders. Ordering several wall brackets will make sure that there is sufficient storage for each gas cylinder. These brackets offer excellent value in a simple, durable design with no nylon straps to break, or plastic components to break off.